Training is the life-blood of any organization. As a business owner, trainer, or supervisor, how can you improve your training skills so that you have the best-trained team members possible? This business training DVD program quickly brings you up to speed on the most effective training ideas and techniques, and shows you how to use what you’ll learn in your own organization. In no time at all, you’ll be designing and conducting training that delivers impressive, measurable results — for your trainees, your organization and in your own career. Getting organized: logistics, snacks, room layout, name tags, etc. Support materials – flip charts, handouts, slides, etc. Evaluating your success: designing and implementing effective evaluation tools. 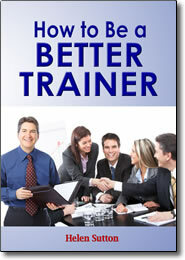 With the skills and techniques you’ll develop in this must-have program, you, too, can be a better trainer. Learn to plan, prepare for, execute, and evaluate your training programs by implementing these proven ideas and methods into your training programs.